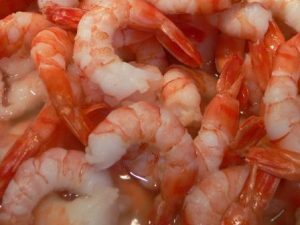 Several different types of prawns are found in both seawater and fresh water and they are also widely farmed in various countries. The term “prawn” has a variety of definitions. In some regions, the term prawn is limited to fresh water palaemonids. In the Eastern Atlantic, a type of small lobster is called “Dublin Bay prawn”, nephrops, Norway lobster, langoustine, langostino, or scampi. In Greenland, Scandinavia, and many European countries the term “prawn” is commonly applied to coldwater species while the term “shrimp” is used mainly in North America. In Asia and other areas, farm raised freshwater shrimp are called prawns. China is the leader in farm-raised prawn production although numerous countries in southeast Asia also produce prawns. Prawns are served as several dishes like curry and pickle in southeast Asia, and as garlic prawns in Spain. Other dishes include prawn sauce, tapas and potted shrimp. Prawns are also served with chicken wings and rice. A delicacy in the Philippines is prawns in coconut milk. The dish is prepared by cooking prawns in coconut milk with a ginger, salt and pepper.